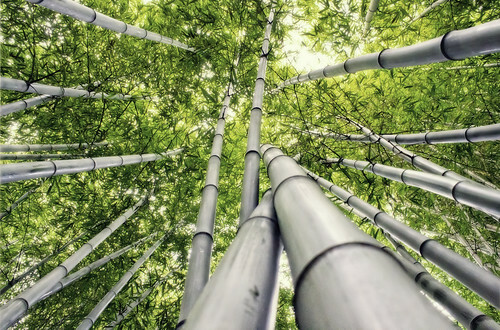 Above Image: Bamboo is resilient by being both rigid in maintaining its structure, while also being flexible enough to bend during a variety of weather patterns. Most of the coverage of the collaborative economy has focused on what it means for consumers (Airbnb, Lyft, Uber) but what does it mean to corporations? This post will answer that question. Companies that tap into the crowd for instant workers (oDesk or Taskrabbit for business), or to unlock their idle inventory to it into cash (Liquidspace, Shardesk), or to tap into the crowd for new services (Crowdspring, Uservoice), can benefit significantly from reduced costs, unlocking new business potential. A company can tap into an on-demand workforce using Taskrabbit for business, or oDesk for coding, office admin, writing, and pretty much any other service. A company can instant-lease their unused desks to travelers or other companies who need meeting and workspaces furnishings, using Sharedesk, Liquidspace, Pivotdesk and others. An executive who needs a quick, clean, place to work in New York can quickly access meeting rooms on demand at Breather room or access an Uber to get to a key meeting. Marketers who want to infuse consumer-created content that’s trusted and cheap can use Mass Relevance, LiveFyre, or About Echo to integrate social content into their digital marketing on demand . Research & Development teams can tap into the crowd to generate new ideas for products using Uservoice, Salesforce Ideas, or listening to their communities in Communispace, Passenger or Vision Critical. I see at least four major benefits that traditional organizations will gain by joining the Collaborative Economy. Quickly expand or contract workforces. Popup companies mean corporations can assemble a team on-the-fly, at low cost and lower risk. For most companies, staffing is the highest cost of operating. Companies who properly tap into this on-demand workforce can always stay ‘right sized” by adding staff on demand as needed. Expect new forms of contract groups to emerge that work well in tightly-collaborative teams, akin to virtual agencies. Expect the future of work to continue to move towards “individual enablement.” Future workers can serve many masters as they offer specific niche skills. Expect that knowledge management, core institutional knowledge, and a permanent team that drives company strategy to still be key in-house resources. Activate unused resources to generate incremental revenue. Companies can generate new revenue by activating unused inventory and assets such as unused real estate. They could also outsource idle workers into workplace marketers, serving other partners and corporations. Instead of laying-off skilled people, why not loan or lease them to other companies until you need them again? Often, physical locations are the second-highest cost to corporations. These can be utilized as crowd resources by turning them into rent on-demand to other partners and corporations. It works in reverse as well with companies renting from others, reducing overhead and the liabilities associated with managing multiple properties. Expect the Regus model to eventually be extended to management consulting firms, companies with seasonal businesses or companies that have many locations, like retail. Reach new markets through new business models. Corporations that have idle resources, inventory or products, can activate these resources and rent to new markets on demand. For example, Bloomingdales, Nordstrom, and other high end retailers can benefit from replicating the business model of Bag Borrow and Steal, which makes high-end purses available to a whole new class of on-demand consumers. Don’t sell a product once, sell it a hundred times. I’ve listed many new models emerging just for the luxury market. Corporations that have idle, consumable inventory, such as food, can shift to Eat Feastly, a growing consortium of local chefs at home. Unsold cars sitting on dealership lots can be put to rent like Toyota Rent a Car or BMW’s version. Tap the crowd for new innovation of goods and services. Finding, hiring and retaining creative people are difficult things to do. Instead, seek new models that enable desk-sharing that brings “creatives” together to work when they are available, at your office, spreading some of their ideas and energy to those around them. Pepsi, which used Mass Relevance, was documented tapping into the broader crowd by aggregating their messages to improve digital and real-world marketing. Take, for instance, models like Kickstarter or Quirky that tap into the crowd to fund and source new ideas. This is the next form of innovation. Software providers like Spigit, Crowdtap, BrightIdea, also enable corporations to glean these opportunities on their own branded platforms. Phase 1: The sharing startups will unveil APIs for new growth. Like oDesk, expect new APIs to be available from Airbnb, Lyft, Taskrabbit, Liquidspace and others that connect social media management systems like Sprinklr, Expion, Spredfast, Hearsay, Adobe, Oracle, Lithium, and Salesforce. Together they will enable corporations to manage inputs and outputs of the collaborative economy. For example, last week I was briefed by oDesk, which has a number of APIs that enable their customers to manage large batches of tasks of their vast supply of on-demand workers. oDesk shared with me that they see opportunities for even more developers to engage, expanding their market share with new applications, unlocking new value propositions that traditional corporations have yet to realize. I expect that, as the sharing startups mature, they’ll unleash these APIs, just like Facebook, LinkedIn, Microsoft and Google have done. Phase 2: A new era of Collaborative Economy Enterprise Software will emerge. Don’t expect these startups and social media management systems to be the only game in town. There’s already a broad range of enterprise software, such as Uservoice, Get Satisfaction, Oracle, Salesforce, Lithium, and Adobe, that offers enterprise-level collaboration of media and ideas. I expect a new class of software to emerge that enables branded marketplaces (like Airbnb) for corporations to manage their own two-sided marketplaces of buyers and sellers so as not to have to rely on the sharing startups. I wrote a post, putting out a call to the market, identifying this “blue ocean market,” but no providers having emerged as yet. Phase 3: Corporations will tap into the crowd for non-crucial goods and services. In a not-so-radical vision of the future, expect that the most resilient corporations will start to engage the crowd for non-essential business functions in their attempts to reduce their overhead. In this scenario, it will be difficult to tell the difference between customers and employees. Companies that tap the crowd for most of their business functions will reduce costs, maximize productivity on demand, and might end up with the only remaining long-term assets being an ecommerce system and a brand, which should directly translate to more profits for shareholders. In the future, the on-demand, creative, and resilient crowd actually becomes the company, reducing risks and costs while providing the opportunity to increase profits. Closing Thoughts: The Collaborative Economy Can Make Corporations Resilient. Corporations have an opportunity to tap into the same sharing behaviors we are seeing in the consumer market. I’ve given you a definition, clear examples, insights, and a roadmap for future phases. Companies who tap into the crowd will reduce costs, some forms of liability, and can generate new revenues by activating existing resources and collaborating for new value creation. The crowd makes corporations resilient. Read the definitive report, The Collaborative Economy, which has been broadly read on Slideshare and beyond. In the Collaborative Economy, your company provides a platform for customers to collaborate on a variety of business functions. Your company becomes a service, in the collaborative economy. Check this list of corporations that have joined the collaborative economy, called the ‘brand edition’ where I cite some 20 companies who have already joined. See all the posts tagged “Collaborative Economy” to peruse the whole body of work.